The 16th President of the Philippines will be delivered his first State of the Nation Address (SONA) this Monday afternoon at 4 p.m., July 25, 2016, at Batasang Pambansa Complex, Quezon City. President Rodrigo Duterte wrote his own speech for his SONA. According to the survey results of a Pulse Asia Research, Inc. released on July 20, 2016, President Duterte is now the new record holder of most trusted president in the country. Former president Benigno Aquino III used to hold the record of the highest level of public trust in the Pulse Asia trust survey first conducted in 1999. He (Aquino) had a trust rating of 85%. While the new president Rodrigo Duterte received a 91% of Filipinos trust, according to the Pulse Asia president Ronald Holmes. 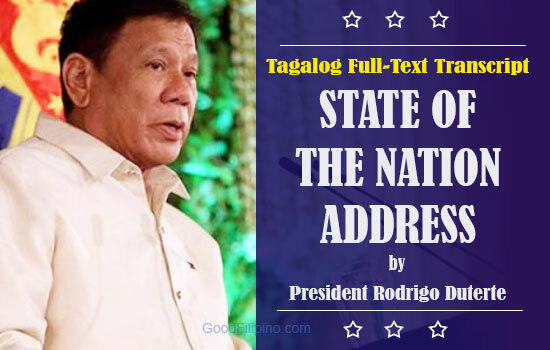 Please bookmark this page now and visit more often for more updates and details about President Duterte's 1'st State of the Nation Address (SONA 2016) in Tagalog version. As a former prosecutor, I know there are always ways of knowing how fast or how slow cases go. What I did was to look into the number of postponements and the time difference between each postponement and the next setting. It was simple as that. I will appreciate deeply if we all in government attend to this urgent need. All of us want peace, not the peace of the dead, but the peace of the living. [applause] We express our willingness and readiness to go to the negotiating table, and yet we load our guns, fix our sights, pull the trigger. It is both ironic and tragic— and it is endless. While we extol the bravery and heroism of our soldiers — kayo the rebels -- do the same for the members and fighters. What I see instead are the widows and the orphans. And I feel their pain and grief. And no amount of cash assistance or the number of medals can compensate the loss of a human life. [applause] Sorrow cuts across every stratum of society. It cuts deeply and the pain lasts forever. If that is the only worry that you have and I can understand your misgiving. Wala na ito sa... ang haba. [laughter] Wala na ito sa script. You know, ako maka-garantiya, 101 percent it will be clean. The problem is I can only act through agencies and departments. That’s why I urge you na maski konting mali lang, wala akong ano sa inyo, wala na akong politika, wala na. I’m through after this. I just pass on to you the information that, you know… I act through secretaries and... I cannot guarantee their honesty and competence at all times. Cabinet members, yes. Pero yung sa baba — yung procurement, yung magbi-bidding diyan. But as far as I can really — malinis talaga ‘to. At napag-usapan namin sa likod about the federal system. Mamaya yung kayo — kaibigan ko — tangad, tangad, tangad [laughter] Kaya huwag na ninyong gawin. Simple lang ‘yan eh. Para walang away sa gobyerno, yung mga bagay na illegal at masama at hindi tama, huwag mong gawin, at hindi kami mag-aaway dito [applause]. Ulitin ko ha: He who is the cause of the cause is the cause of them all. Kami nagta-trabaho lang. We have a mission to God. We have millions of people to see that they are healthy. It’s a question of drug, it’s a question of public interest, public order. Kita mo, lesser crime. Wala na kasing magnanakaw, wala nang naghoholdap. Kasi para —Bakit tapos sabi nila eh, 'maliliit lang ‘ yan'. Gamitin mo utak mo. Diretso ng Cavite, mulipad doon kay Tolentino. [laughter] 'O bakit may train dito sa Tagaytay?' It’s quite fast, quite fast. Sixty kilometers per hour and you are pulling something that’s heavy. When it really moves — mawala ng ano— it moves with a speed at a heavy thing at a great speed, ang hirap mong... Sumasadsad kasi mabigat eh and reduce headway time from 5 minutes to 3 minutes. Mahina lang tayo...Ang plano ni Tugade, mahina lang tayo ng one minute sa Hong Kong. Two minutes, sa kanila three minutes eh. Art, ambisyoso ka ah. Kaya mo kaya ito? Specifically for the LRT, the operating hours shall be extended from 9:30 to 10:30 p.m., so marami pang mga bata ang uuwi niyan. [applause] And to absorb more passengers, delays in the procurement of additional trains shall be addressed soonest. Now, iyan ang sinasabi ko, if you want the long way, fine. Wala akong problema. Sabihin ninyo na doon ang — we go the normal way if we are able to make purchases. Eh ang maganda nito, I have signed the Executive Order sa aming FOI. Naunahan ko kayo. Iyong inyo... Nandoon na ang sa akin [applause]. Oo, tapos na ako. Ilabas ko na — it will be out today. Alam mo sabi ko, unahan na natin itong Congress, puro mayayabang ang mga nandiyan. We grab the — each other...They say, "stealing one’s thunder," ika nga. Unahan na natin. To better manage public information, a law should be passed – I’m addressing Congress-- to create the People’s Broadcasting Corporation, replacing PTV-4, [applause] the government-run TV station, which now aims to replicate international government broadcasting networks. Teams from these international news agencies — I’d like to mention those interested BBC — are set to visit the country soon to train people from government-run channels to observe. Ito ang gusto ko — tutal pera naman ng tao — to observe editorial independence through innovative programs [applause] and intelligent treatment and analysis of news reports, as well as developments of national and international significance. For the many times nadaan ako na walang ulan, doon lang sila because first come, first served. And the only outlet there — the outlet of your department is yung sa SM. So yung mga, maawa ako. Dito sa side sa Cotabato, lahat ng Cotabato, doon sa Davao. Karamihan yan, walang mga bahay. If you’re an applicant in Davao City, fine. But you know, kung walang, mahirap kasi. Karamihan diyan, mga Moro. Naghihiga lang diyan sa pavement. Nasasaktan talaga ako. Masakit eh. Buong gabi mo hintayin hanggang mag-bukas yang SM kasi first come, first served. I have the reason why I do not go out. I do not accept invitations. Hindi ako tumatanggap because every time I travelled around Manila, it causes a huge congestion. Kasi pag itong pag-uwi ko, [inaudible] by projection. Paglabas ni presidente, ano yan, picture taking ganon. And they start to block the — yung roads access to the...Ganon iyan. Everytime a president come out, ganon iyan. So, paparahin nila iyan, sasabihin nila, dadaan iyan by this time. And in the meantime, sarado yan. Paglabas ko, akala mo Biyernes Santo. Walang sasakyan diyan. I may now also ask on Congress to consider drawing up bills consolidating and merging agencies and offices having to do the Overseas Filipino to have a department that shall focus on and quickly respond to their problems and concerns. Kailangan ko ng isa. [applause] And I have asked… I don’t know if Secretary Bello is here, Bebot. Wala? Absinero talaga yan. [laughter] Maski sa Cabinet absinero yan. Gusto ko, he will rent or we’ll lease some buildings here for overseas only. At lagyan ko ng — and they will direct all BIR, lahat na. BIR, lahat ng something to do with the clearances of the police, in one building, may booth lang. I said: My God! Make use of the computer. We have to adjust to the needs of our people. Total diyan naman yang sa squatter na yan, as long as I sit here as President, there will be there no demolitions without relocations. Hindi talaga ako papayag. [applause] Hindi naman aso yan na — just like in Davao. I’d like to make a dialogue with the businessmen. “Sir, how much are you investing in this land you have bought with the squatter?” "So, I bought it at about 60 million." Dagdagan mo ng 20 million. Ako na ang bahala. Sabihin ko doon sa mga tao, "Bili tayo ng relocation site or I will provide." Government will expropriate. I will make use of the expropriation powers. Ako ganon sa Davao eh. I have 20 hectares there. I will expropriate some land there. Iyong malapit lang. Then sabihin ko: "This 20 million will help your journey to a new land." And I will urge everybody na yung mga bagong mga factories, doon sila mag-tayo. I have directed the concerned regulatory agencies to prioritize the issuance of required permits for power development. Okay ‘yan sa akin. Ang problema sandali ito. [Para ka diyan.] Iyong mga environmentalist, meron tayong, meron tayong, ano kasi-- marami ang coal. Pati yang... Ito nga, itong energy emissions, wala man akong problema diyan. But do not tell me na, if you... Ambassador ka tapos sabihin mo sa akin na, 'medyo hanggang diyan lang kayo, kasi kami hangang dito lang kami. ' Sabi ko, 'Ano? Kayo umabot diyan. You are now in the apex of your industrial might. But along the way, you were the first -- America, China, Europe.' Kayong bomba-bomba, until now we contribute only something point zero. So, if you put so much restrictions doon sa treaty na yan, the treaty which we are trying to — it's still here in the Senate. Let us be very clear on this: We need to industrialize. We need the power and, therefore, the emissions would also be considered. You just can't say it: 'I established five economic zones here'. And you start to say that, 'you are spewing so much carbon footprints'. Mahirap yan. I mean, it's hard. I cannot just agree on anything that will delay. I’m only good for six years. We will also intensify and expand Alternative Learning System programs. The government will also provide universal health insurance for all Filipinos [applause]. Benefits -- Sali na lang natin sa PhilHealth. I have nothing but the interest of my country. But let’s wait because the PDEA says that — it's about the past statement made by the Philippine Drug Enforcement Agency. Two years ago, PDEA came out with a statement that there are 3 million drug addicts in this country. That was two or three years ago. How do you think — would the number incrementally if we count now? Hindi na magdadaan yan ng...All they have to do is to triangulate where the —pag-ikot niya. and there's so many — and they are in codes. If we do not help from our friends here in Asia and America, and Europe — this year number and problem, believe me, will drown us as a Republic. Here's the reference links for SONA 2016. Comments or suggestions about "SONA 2016 Full Text Tagalog Transcript of President Duterte" is important to us, you may share it by using the comment box below.